Hi foodies...Welcome to AYESHA'S KITCHEN...Today i came with a special chilled salad which is also a great appetizer salad. 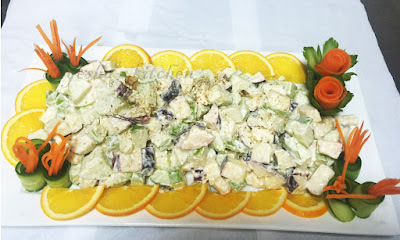 Waldorf salad or salad with chopped apple and celery. According to American Century cookbook, the first Waldorf salad was created in Newyork city, US. This salad is generally made of fresh salad apple, celery, walnuts dressed with mayonnaise, sugar and lemon juice served with tons of lettuce as an appetizer or a light meal. Like most of the salads, this too is chilled before serving. In a bowl, whisk together mayonnaise (yogurt), lemon juice, pepper powder, salt and sugar. Mix well. Add the chopped apples, celery, grapes (optional) and mix well. Sprinkle the crushed walnuts and served with a bed of lettuce or cucumber slices..